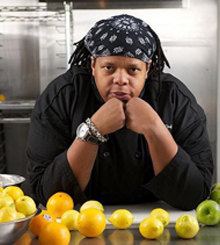 Washington, DC—May 23, 2016—Some of the District’s most talented chefs will lend their skills to serve a mostly forgotten population—homeless men—on May 23, 2016, at 6:00 pm in the Gales School shelter’s dining hall (65 Massachusetts Ave, NW). Celebrity Chef Rock Harper, Hell’s Kitchen winner and president of RockSolid Creative Food Group, SugaChef owner and TV personality Chef Padua Player, Mitsitam Native Foods Café Executive Chef Jerome Grant, Capitol Hill Crab Cakes owner Chef Horatio Davis, International Gourmet Foods Chef Joe Cacciola, and Chef Princess Green, are volunteering to prepare tasty meals for the evening’s Overnight Guests and Mission program students. According to Chef Rock Harper, “These guys at the Mission are taking their first steps to turning their lives around. I’m just grateful to God that we can cook our brothers some good food.. 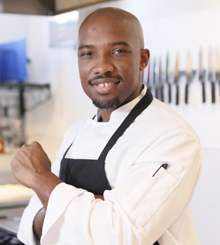 This is a way we can show that we care about them and the hard work they are doing.” SugaChef owner and TV personality Chef Padua Player will take his creativity to the dessert table for a sweet finish. Media are invited to participate in this dinner and interview chefs, Mission staff and homeless guests. Please contact Deborah Chambers at 202-534-9965 or dchambers@missiondc.org for information or to rsvp. Chef Harper and Chef Player are also headlining at HeART & Sole, an October 27, 2016, event featuring innovative food tastes and signature cocktails all to benefit Central Union Mission’s homeless and poor neighbors.